So far, only the initial episode has been released. However, if the show carries on with the potential of this episode, then I think this may well be one of the best series of the season. 2014 is a promising year for anime, and so far I have not been disappointed with the titles that have already launched. Is it a great show? I'm not sure but it is enjoyable and if you appreciate a show with good animation and music you'll already like this show. So far it has a unique yet predictable plot with the show already having the generic character tropes. Not necessarily being a bad thing though,but plot wise I can't say much considering this was the introductory episode what I can say is this show has potential to being one of the best series of this season and deserves to be given a chance. This is a great slice of life. You won't regret watching it! Not going to lie, the name and the cover throws me off since I figured that warplanes and love doesnt add up or that it will be a very boring and clique story. But nope! The story takes place in the eyes of a young boy who will take place in this search for the new world. 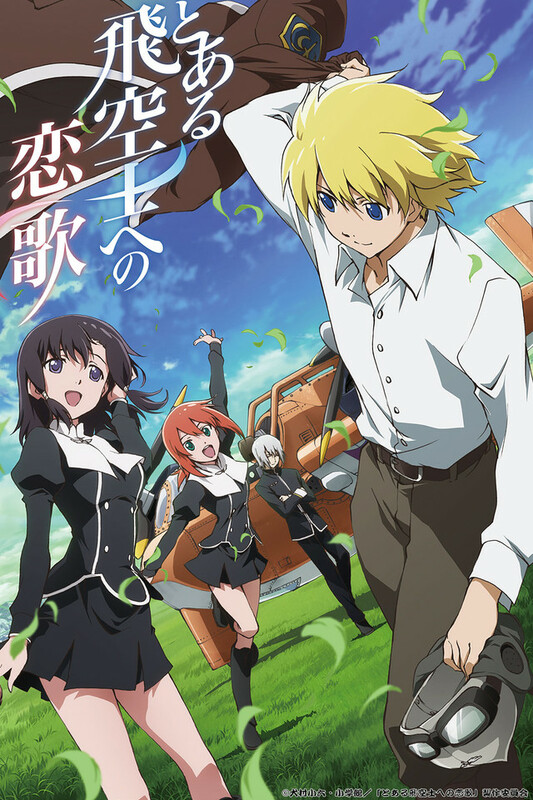 Give this anime a chance as you learn about their interesting warplanes and learn to experience what it's like to be in war. It is a very good show! I promise! This is a show about unique airplanes, a love story, vengeance, and exploring the unknown. don't be fooled by the happy looking style, people start dropping AOT style. When I read about this show I was wondering if the title matched what I saw in the first episode.Thank goodness it so far has exceeded my expectations. It does have some class-warfare cliche's that are a bit annoying but after three episodes I like where this is going. The back story is becoming more apparent and integral to the show. It will make some good drama later one, I hope. I also like the character designs and the airplanes they fly are pretty cool. Old style props but modern is maneuverability. This adds to what could be just another air warfare show. You will enjoy this show for the most part and after episode three you will get quite a bit of the back story to like it more. I feel like the first three episodes successfully introduced the main characters and settings of this anime. I'm not sure what it is but there seems to be this underlining, unpronounced theme of anguish, possibly a foreshadow for what's to come. If the current entertainment level carries through for the rest of the show, this anime could end up being a front runner for the winter season. The story was well-written with good setup for characters you care for. There is quite a bit of romance in this series and is actually done better than a lot of series as you can sense the love in the air. Music was spot-on especially during romantic moments and during tense battles. Each character was quite memorable and there is plenty of well-thought out humor. The banter between the brother and sister was quite amusing. I almost overlooked this series, but was a pleasant surprise. The setting was quite different, but made it rather unique with the aerial battles and the lore behind the world. Recommended. Personally, I think that this series had a good amount of potential. Though it may have seemed to be your standard "friendship" series, it really had more to it. Unfortunately, the execution of The Pilot's Love Song removed that potential almost completely. Yes, it was definitely not boring, dull, or ridiculous. However, it did have major pacing issues and plot armor is used like crazy. The characters are a mixture. Some have depth, some have no depth, and others switch from the former to the latter and back and forth. The music is decent, but the animation is most of the time average. Overall, this is a series that wouldn't hurt you to watch it, but there are a lot better ones out there that I would personally recommend before this one. For those who don't know, Miyzaki is one of the most famous animated film directors known best for creating Spirited Away, Howl's Moving Castle, and Totoro. The artwork, animations, and music give a sort of feel like something he would create. Though the series has a pretty generic plot, the voice acting, animations, and artwork are solid, holding the story together well and creating opportunities to make this series amazing. The story starts a little slow but there are moments even in the first episode when you feel somewhat a sense of comforting nostalgia. So far everything is average or exceeding the expectations I have given the series. The Pilot's Love Song, while quite plot focused, does have some failings towards the end, where developments are left unexplained, or don't seem to fit with the information we have from previously in the series. I cannot recommend the series because of the execution or action either. In horribly mismatched battles, our protagonists, flying planes about 50 years behind their opponents' technically, and who are still only students of flying, somehow manage to come out mostly unscathed. There is some character death, so be aware of that, but the amount is surprisingly low for such an underequipped army. The animation also leaves much to be desired in many areas, with faces frequently changing shape during conversation, and features and movement are often jerky and lacking in detail. Despite this, the character design is solid, and if you focus on the plot, rather than aesthetics, it is possible to forget about poor animation, especially in the more emotional scenes.